We will be on the air today with our host Annie Rivera from "Annie Talks". The topic will be “Annie Talks with Tax Preparer Joey Jimeno - Last Minute Tips for Tax Preparations. 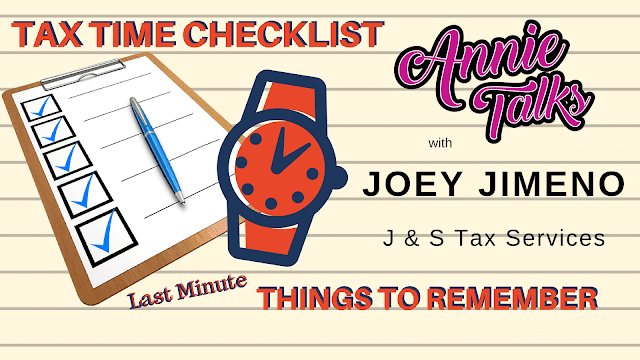 In this episode of Annie Talks, Annie spoke with Joey Jimeno of J&S Tax Services, who lives and breathes for this time of year -- working late days and nights -- all to help you prepare your taxes. Joey lends his insights on things to remember, things to prepare, really -- a checklist of sorts -- before filing your taxes. You'd be surprised the things we all forget to bring along with us before meeting our tax preparer. He also shares some of his pet peeves during this time of year and how we can start preparing for next year.